Rosaries and medals blessed by Pope John Paul II were given to young Catholics from persecuted countries at World Youth Day. Catholic charity Aid to the Church in Need (ACN), which held an exhibition about Christian persecution as part of World Youth Day’s cultural program in Madrid, gave the blessed objects to visitors to the exhibition from countries where Christians experience violence because of their religion. The rosaries, miraculous medals, and medallions of the Sacred and Immaculate hearts given to the pilgrims were blessed by Pope John Paul II during an audience on August 20th, 1986. Among the first young people to receive the rosaries and medals were pilgrims from Egypt. Edward Clancy, ACN-USA’s Director of Evangelization and Outreach presented the first pouch of blessed items to a young man from Egypt. A priest from Alexandria in Egypt, who asked to remain anonymous for fear of possible attack, spoke out about the terrible situation affecting Christians in the country. 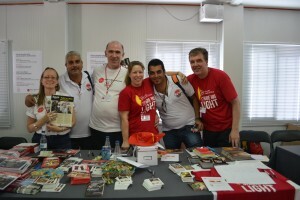 The priest, who took his group to the ACN exhibit, added that living in a country where they were a small minority they were strengthened in their faith by seeing they were part of the universal church, although the young people were physically very tired as they had not been getting much sleep at World Youth Day. More than 800 young pilgrims from Egypt were in Madrid for World Youth Day. ACN is a great organization. We’ve been supporting them for years, and they have never disappointed us. Every cent you donate is used with great care. They are also a good source to hear these stories of persecuted Catholics around the world. God bless the Catholics in Egypt who are suffering so terribly.